The Glenaladale deposit was discovered in 2004 by Rio Tinto and regarded as a major discovery due to its extremely high zircon grade. 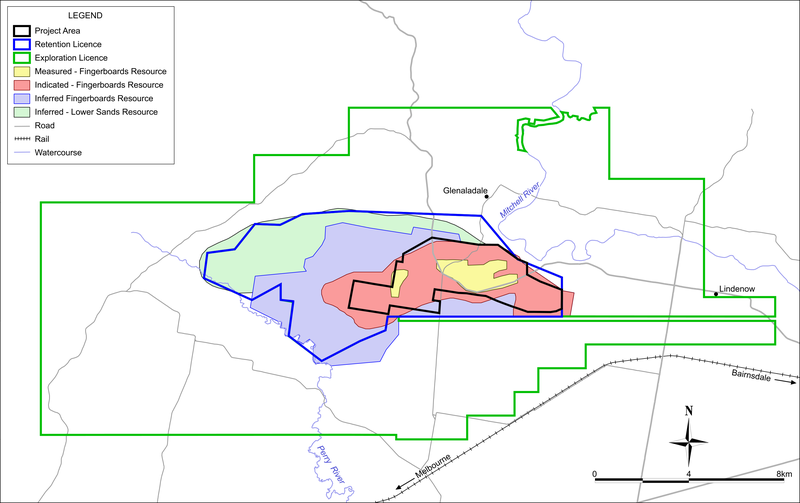 Kalbar Resources acquired the project in 2013. It has conducted extensive drilling and applied advanced analysis methods to delineate a new high value ore body within the Glenaladale deposit called The Marker, which underpins the economics of the Fingerboards Mine. Multiple metallurgical programs have shown the successful production and marketability of the mineral sands products. In 2017, Kalbar completed a Pre-Feasibility Study that showed the mine will be one of the most significant and environmentally sustainable supplies of zircon and rare earths in the world. These minerals are in high demand as they are essential for the high-tech and renewable energy industries of the twenty-first century. Currently, Kalbar is undertaking the Bankable Feasibility Study, the final technical and economic study required before an investment decision is made. Kalbar is also currently undertaking the Environmental Effects Statement, which is the key approval required in Victoria. The Fingerboards Mineral Sands Mine is located in the eastern part of the Glenaladale deposit. It represents the first phase of mineral sands production from the Glenaladale Resource. The Glenaladale Resource currently stands at 2.7Bt of ore, making it one of the largest deposits in the world. The Fingerboards Mineral Sands Mine is located in the eastern part of the Glenaladale deposit. It represents the first phase of mineral sands production from the Glenaladale Resource. The deposit occurs within unconsolidated sediments and contains highly sought after zircon, rutile, ilmenite and rare-earth minerals. These minerals are denser than sand and clay particles and can be efficiently concentrated using physical separation processes to form a valuable export for Australia. The Glenaladale Resource currently stands at 2.7Bt of ore, making it one of the largest deposits in the world. The Fingerboards Resource and Reserve sits within the larger Glenaladale Resource and represents the most economic and mineable ore within the area. The Fingerboards Mineral Resource Estimate contains 1.19 Bt of ore at 0.5% zircon, 1% titanium minerals and 0.1% rare earths. A reserve has been demarcated within this resource that is compliant with JORC 2012. The reserve contains 170 Mt of ore at in situ grades of 1.24% zircon, 1.9% titanium dioxide and 0.11% total rare earth oxides. The geographical relationship between the Glenaladale Resource and the Fingerboards Resource and project area is shown in below. The total project area is 1,675 ha of predominantly farmland. The area occupied by mining activity and plant will be approximately 280 ha at any given time. The project area and infrastructure layout is shown below. The selected mining layout is a series of cells approximately 300 m wide by 500 m long. The initial void will establish a pit floor and working faces. The mine is expected to have two active mine voids of less than 40 ha each at any one time with an area of 19 ha being used for coarse sand tailings disposal. The mine voids will be relatively shallow, averaging 29 m deep.The active mining area (working face) will advance approximately 2.5 km per year. The Fingerboards Mine will use conventional earthmoving machinery for a dry open-cut mining method. However, it should be noted that we are investigating hydraulic monitor mining as an alternative or add-on. The valuable heavy minerals will be concentrated using physical separation processes to produce magnetic and non-magnetic heavy mineral concentrate. The heavy mineral concentrate will be exported for secondary processing in mineral separation plants in Asia. The thickness of the ore is expected to vary between 10 and 30 m, with thinner, higher grade ore horizons occurring in the earlier years. 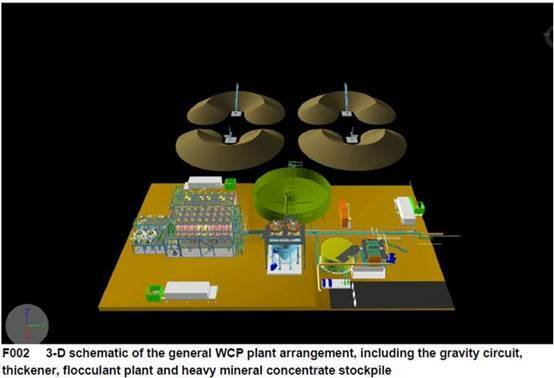 Ore extraction will be conducted initially using scrapers, as these are cost effective in the thinner ore horizons and provide the most flexibility with respect to the mine pit. The scrapers will transport the ore to the Mining Unit Plant (MUP). It is planned to mine the ore at a capacity rate of 1,500 tph, which equates to 12 Mt/year. 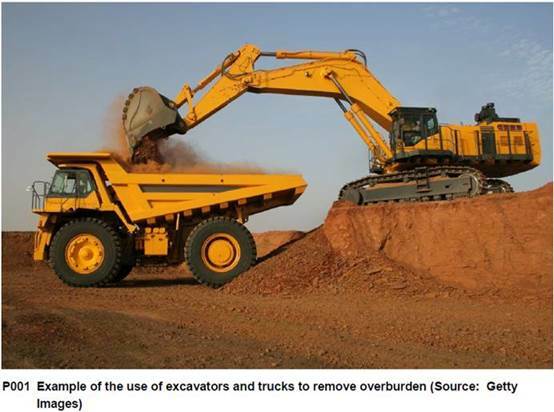 During the first two years of operation, ore mining rates may be lower, given the higher grade of the ore. After this period, it is likely that dozers and a dozer trap MUP will be used for mining the ore.
Mined cells will be progressively backfilled with sand tailings and clay/silt tailings which will then be covered with overburden (including subsoil) and topsoil as part of the rehabilitation process. Rehabilitation is a continuous process, beginning almost as soon as mining commences. Once mining is completed in an area the rehabilitated area will be returned to the original land use, and in some areas will be returned to its pre-agriculture environment. It is expected that the time from overburden stripping to completion of rehabilitation and re-establishment of grazing will be between three to five years. This progressive rehabilitation behind the active mining areas results in a maximum area of disturbance of approximately 225 ha at any one time. Kalbar is investigating multiple options for transport of concentrate to market. The major deepwater port in Melbourne is accessible via a railway that runs 6km to the south of the mine. 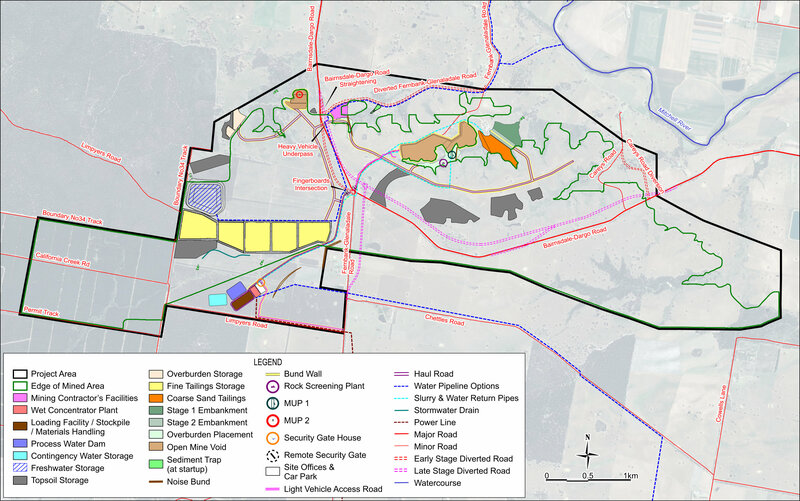 Kalbar is investigating constructing a new spur and dedicated haul road or concentrate slurry pipeline. The concentrate going through Melbourne would be containerised which is preferable to some customers. Equally attractive are two existing ports in Corner Inlet, 160km south of the mine. There are three existing roads from the mine to the Princes Highway. The concentrate would be shipped as a bulk mineral from these ports. It is likely that Kalbar will use a combination of bulk and containers depending on customer and product. Subject to approvals, Kalbar proposes to begin construction of the project in 2019, with mining operations to commence in 2020. Construction and commissioning/start-up will take approximately twelve months. The approvals process for the Fingerboards Mineral Sands Project commenced in the second half of 2016 and includes an Environment Effects Statement (EES) under the Victorian Environment Effects Act 1978. 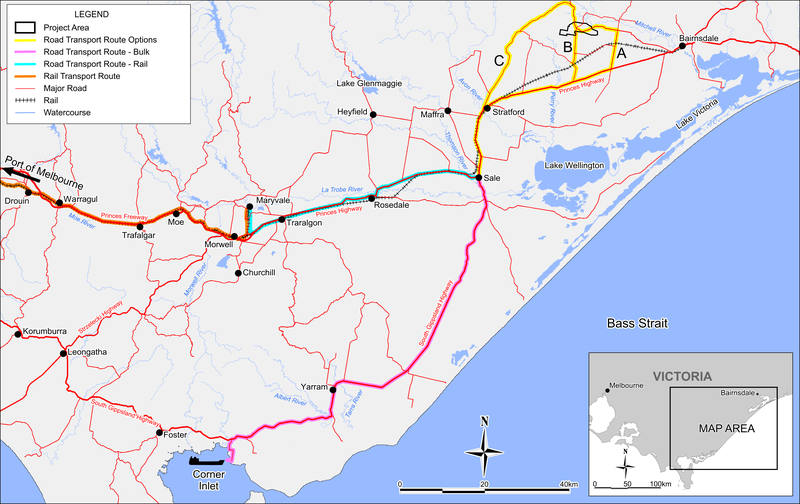 Kalbar anticipates completion of the EES process by mid 2019.